These balls are primarily made to help stabilize fluid motion in tanks and containers. They are suitable for most all fluids from potable water to gasoline and diesel fuel. They can also be used in all kinds of fluid mechanic applications as is shown by their selection as the "Orb" balls for the National SeaPerch Challenge 2016. 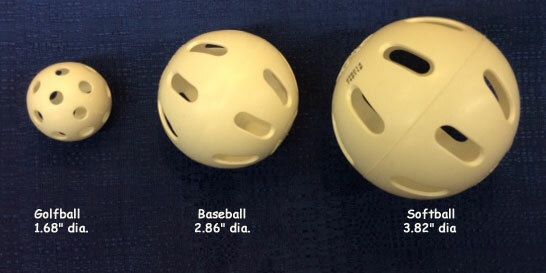 All WIFFLE balls are tested for product safety. They are all made of Low Density Polyethylene (LDPE4) that is also recyclable. The balls are food grade safe and of course lead and BPA free. Made in multiple sizes to fit into most filler tubes and access ports. Can be poured directly into a tank or vessel as no assembly is required. Writer's note: Unless you are airborne when your tank runs dry, you can simply grab a ball and go play WIFFLE ball while you wait for a refill. Try that with any other Baffle ball!